YouTube has enriched everyone with a whole lot of digital entertainment, incl. movies, TV shows, games, to music of all kinds. But it is only a fair-weather fan of active internet connection. More of a bother, YouTube videos, generally in FLV formats, are nit-pick over some media players. But there are times you may want to download and process them, e.g. you want to watch a noble educational video off YouTube on the go where there is no Wi-Fi, burn them to a DVD for archiving, transcode YouTube video to MP3 for listening while you are driving, customize the video of a kitten playing the piano in iMovie, etc. A good jumpstart is to rely on a YouTube converter. But what is the best YouTube video converter for Mac and Windows? Free download videos, movies, TV shows, 4K from YouTube and 300+ sites and convert downloaded YouTube videos to MP4, MP3, MKV, etc with 350+ profiles for the latest mobiles. NO.1 fast YouTube vdieo processing speed & no quality loss. Actually, the chance of finding Mac-based YouTube HD video converter is really slim. But there are still a lot of people who are in great demand of the best YouTube converter for Mac without any ads or viruses while functioning well with regards to YouTube transcoding ability on Mac. 1.Have all YouTube videos and movies downloaded on Mac OS X. 2. Enable all Mac users to play YouTube videos on any devices anytime. 3. Output high-quality video and sound. 4. Download and convert YouTube videos on Mac at fast speed. 2. Constantly update to support downloading new YouTube videos. 3. Feature flexible parameter settings for fast speed, good quality and small size. 4. Readymade profiles for users to further play, edit and upload YouTube file. Actually, for Mac users searching the best way to download and encode YouTube videos without going awry, MacX Video Converter Pro is the best tool that gets YouTube videos downloaded and converted on Mac once and for all. I supports pretty much any video and audio formats, portable media devices and video editor, helping to convert YouTube video to MOV, FLV, AVI, MPEG, MP4, WMV, etc, process the downloaded videos directly for iTunes, iPhone 7, iPad Pro, iPod, Samsung, HTC, PSP, etc, and import these downloaded YouTube videos to iMovie, Final Cut Pro, etc. What's more, the magic of this program also glosses right over the simplicity and focuses on video quality and converting speed, endowing Mac users with 1:1 image quality while the whole process can complete with super fast speed on macOS Mojave - Leopard with no difficulties. 3-5X faster YouTube video conversion than competitors, thanks to the support of Multi-core CPU, hyper-threading and Intel 3-Level hardware acceleration. Directly convert YouTube FLV, MP4, WebM and other SD/HD videos to 180+ video and 14+ audio formats. Built in 400+ device profiles for the latest mobiles, including iPhone 7, iPad Pro, Samsung Galaxy S7, PS4, Xbox One, Windows Phone, etc. Excellent YouTube downloader that can download YouTube videos as well as other online URL videos, incl. 4K, from Facebook, Vimeo, Dailymotion, etc. Customize YouTube videos by trimming, clipping, watermarking and even adding subtitles to videos. 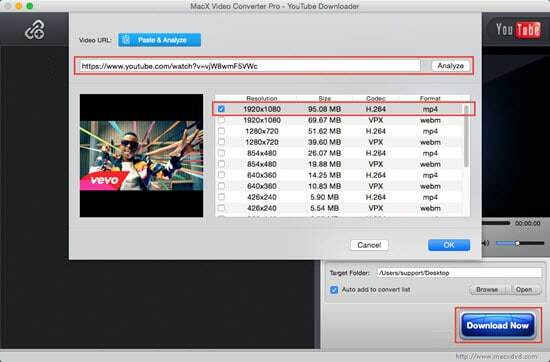 Step 1: Free download the best YouTube converter on Mac OS X. If you have already downloaded YouTube video on Mac, import source video by clicking "Add" button. You don't even need to download the YouTube video file to Mac computer. Click "YouTube" button, copy and paste the YouTube video URL to the type box. Click "OK', this Mac YouTube video downloader will automatically download it. PS, you can add more than one file at a time. Step 2: Choose video format, resolution and file size as you like. You can convert the YouTube videos among SD videos like MP4, MOV, AVI, FLV, MPEG, etc and HD videos such as MKV, M2TS, AVCHD, MOD, and more. You may also convert YouTube to iPhone iPad iPod Android on Mac OS X without any third party tool assistance. Step 3: Click the "Browse" button to save your converted YouTube video on your Mac. Step 4: Hit "RUN" button to start downloading video from YouTube on Mac with the best Youtube video converter. Tips: if you are desperate for a full-fledged YouTube video transcoder for PC, you can switch to MacX HD Video Converter Pro for Windows to do this job. Notice:The software developer doesn't advocate any reproduce, distribute, transmit, broadcast or sell any content for any other purposes without prior written permission of YouTube or the respective licensors of the content. Please refer to YouTube terms of service before doing so. In this article you will get a step-by-step guide on how to download YouTube Video to iPhone on Mac, and watch your favorite videos on this tab with best video quality. Wanna free download YouTube movies to enjoy offline? Here a free YouTube downloader can help you free download movies from YouTube as you like, including those in SD formats, HD and even 4K ultra HD formats. Best YouTube movie converter will free download and convert YouTube movies, TV shows, videos to MP4, MOV, 3GP, MP3, iPhone, Android and more with fast in HQ. It's also a HD movie converter that supports 4K/HD movies from YouTube with high quality. MacX Video Converter Pro is the best YouTube video converter, which can easily convert YouTube FLV videos to iMovie supported formats like MOV, MP4, M4V etc, along with excellent YouTube video download feature.